Warning: The tale you are about to read will make you weep. If it doesn’t, you have no soul. Today was going to be a great day. It was the one day of the summer that I probably look forward to more than any of the year. It’s the day I pack my little darlings in the car and drive for a little over an hour to a blueberry farm where we get to stand in a field, pick berries, and sweat. It’s glorious, and it’s a tradition that we’ve held to pretty much since before Maggie was born. Today was going to be the day. Oh, we left our house at nine o’clock this morning, alright. We drove down the highway. We even suffered through a traffic jam for about 45 minutes while singing “Mama Mia” hits. We finally made it to our destination, albeit a little late, but very excited to start filling our little metal pails with blueberry goodness. Every one of our jaws dropped as the realization of the situation came upon us. I very nearly drove into the ditch. “WHAT? !” we all screamed at once. No blueberries. No blueberry muffins. No blueberry coffee cake. No blueberry crisp. No blueberry pie. 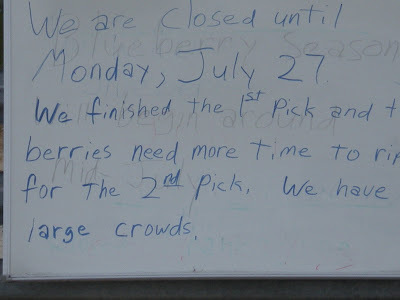 The blueberry farm’s predicament was truly our demise as we realized that today was it. The only day we could work in a trip to the farm to pick blueberries. Next week, all the girls will be gone on different trips, so there was no chance we could go back. My heart started to sink and sink fast. I knew we had to do something (believe me, the thought of parking down the road and sneaking into the berry farm actually crossed my mind for a minute), so we headed into the nearest town to the diner we always hit on our way home, and we ate lots of greasy food at 11:00 in the morning. Disgusting, I know. But desperate times call for desperate measures. And then we headed home. Dazed and confused we were, and suddenly Kate realized that we (O.K., I was) moving through the five stages of grief. Stage 1 – Denial. “OH NO! This can’t be happening! How could they do this to us?” This was the point at which I contemplated hiding my car in the woods and sneaking onto the property. Who cares that I didn’t have a bucket in the car? I’d figure something out. I just knew I HAD to have those berries. Stage 2 – Anger. “I called last week and they said they’d be picking for three weeks! They can’t do this!” My rational brain was completely gone by now and my crazy-out-of-my-mind brain took over, thinking of every possible reason I could have to take that berry farm to court. Don’t they know this is the ONLY day all summer that we could get out to their lousy farm to pick their scrawny berries out in the scorching heat? Stage 4 – Depression. “You girls go ahead and eat your lunch and drink your milk shakes. I couldn’t eat a thing. I’m just too sad.” And on it went, throughout lunch and the drive home. Me, shaking my head, pounding my fists on the steering wheel (I guess that takes me back to the anger stage, doesn’t it? ), and saying, “I’m just so sad” for the next hour or so. Stage 5 – Acceptance. Truthfully? I’m not there yet. I’m not sure I’ll ever be there. I sure had different expectations for today’s blog post. I was going to come home and take pictures of the freezer bags filled with blueberries stacked up on my kitchen counter. I was going to bake a pie and show you how beautiful it was. Instead, I’m sitting, still depressed, on my porch writing this sad tale of woe. The saddest part, to me, though, is that we didn’t make it to the blueberry farm last year either. We were either out of town or too busy, so we didn’t go. And now this. Does missing a tradition for two years in a row make it not a tradition anymore? Because if that’s the case, I’m sadder than I even was this morning. Well...I'm not weeping, but I'm giving your blog my sad eyes. And I just sighed a real heavy sigh for you. Because this is a bummer. I'm so sorry it didn't work out today. HOWEVER, I definitely don't think that missing it two years in a row means it's not a tradition. No way! Oh Shelly, I'm sad for you. Though this tradition is not over with, why not come up with a new one that starts this year? Just you and your girls. Go do something fun with them. Hurry now, before they fly off. So I just looked down at my desk. There lies the latest copy of Gourmet magazine with lemon ice cream sandwiches with BLUEBERRY swirl on the cover. Yummo! Sorry your day turned out so bad because I know what great blueberry treats you whip up! I picked 15 pounds of blueberries today. I think I ate 5 pounds. Really though, I do feel sorry for you...only I am on a sugar buzz from my vanilla ice cream with blueberries and smashed cookies, so I can't be serious right now. Ok, ,I am sad for you, really. That's what I get for being a smarty pants. Make a Good Choice, My Friend! Sorry, Mom. You just knew this had to come out. Here's a Friday Funny for You!